Teaching that God’s gifts are free, Elisha refuses payment for Naaman’s healing. In our small group, we have decided to do a series of one week lessons on interesting, lesser known, people in the Bible. This study of Naaman is the first lesson in the series. Matthew 13:55-56, Mark 6:1-4 and John 6:42 all show this same story, but Luke gives us the most detail. Luke is the only one who mentions the woman from Sidon or Naaman from Syria. It is interesting that Luke was also a Syrian and was not one of the twelve disciples. However, today, let’s talk for a few minutes about Naaman. The story of Naaman can be found in the Old Testament ― 2 Kings 5. There are two important lessons in this chapter involving Naaman, but who was he? Naaman was a wealthy man, a commander in the King’s army. The Syrians harrassed the Israelites often and Naaman, being a powerful man, took a Jewish girl as a slave to be a companion for his wife. The girl was not bitter and she loved God. In the story, Naaman becomes afflicted with leprosy and the slave girl tells his wife about Elisha, the prophet, who can heal her master. Naaman asks the King of Syria to write a letter to Joram, the King of Israel, on his behalf asking him to arrange a healing. 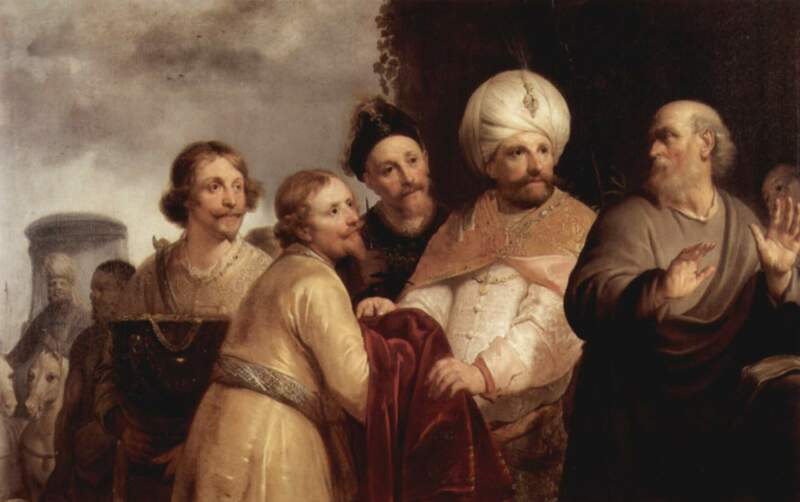 Naaman sets out with great wealth to meet Joram in expectation of a healing. Joram thinks it is a trick and is angered. Perhaps he doesn’t believe there is a prophet in his land? Elisha, the prophet, hears of the king’s anger and sends for Naaman. When Naaman arrives at his home, a servant answers and says the prophet wants him to dip himself in the Jordan seven times and he will be healed. Naaman is angry that Elisha did not meet him personally and make a big fuss over him. Naaman storms off. His servants persuade him to try this simple thing and he agrees to do as Elisha suggested. He is healed. Can you think of a time in your life when you were angry with God? Why is Naaman angry? Healed, Naaman returns to Elisha and offers payment for his miracle, but Elisha refuses payment and Naaman becomes a believer. Salvation is free! However, one of Elisha’s servants chases after Naaman and says that his master has asked him for money and clothing. Elisha, who was with him in spirit, curses the servant with the leprosy of Naaman. Does this remind you of Judas? In Luke 4, the Jewish leaders are angry at Jesus for telling the story of Naaman. Why? Naaman was a gentile, but God sought him out for healing and salvation. God was working in his life even when he did not know God and was not seeking Him. Were the Jews angry with Jesus because he would not perform miracles on demand? Perhaps, like Naaman, they were angry that they did not get what they were expecting? Perhaps they were angry that Jesus demonstrated, twice, how God reached out to gentiles. Technically speaking, the word “gentile” is not in scripture. Sure, it is in the Bible many times, but it is a latin translation (some say mistranslation) of the Hebrew Goy (plural Goyim) and the Greek Ethnos. Both of those words translate as NATIONS. They were used, primarily, to mean non-jewish people. Read Romans 1:16. How does using “nations” in place of gentiles add clarity to the scripture? How does this compare to the Jewish slave and the gentile Naaman in our lesson?